In the 1860s and 1870s, the burgeoning Jewish community in Manchester was centred o the areas of Red Bank and Cheetham Hill, with the more affluent moving out towards Higher Broughton. At the same time, a fashionable residential suburb was being developed in the All Saints area, around Oxford Road – intended to mirror areas such as Mayfair and Belgravia in London. A few Jewish businessmen who no longer wished to live in Cheetham Hill or the vicinity, and who were not affluent enough to move further north or south out of Manchester, settled in this new aspirational suburb but continued to worship in the Great Synagogue on Cheetham Hill Road, half an hour’s walk away. In 1872 David Cowen, a jeweller, together with a few neighbours, declared that they had silently suffered years of inconvenience because of the distance from the synagogue and that they should have a place of worship of their own. A meeting was called on 1 September and by Rosh Hashanah on 3 October services were held in Chorlton Town Hall in All Saints, conducted by Rev H D Marks. South Manchester Synagogue had been founded. Despite opposition by the Great Synagogue towards what they viewed as a breakaway community that had stolen their minister, the new community flourished and grew, and the search began for permanent premises. In June 1873, nine months after the congregation was first established, a three storey building – a former orphans home and billiard hall – was purchased for £930 and converted for the sum of £875 into a synagogue with seats for 100 men and a ladies’ gallery for 60 women. After only two months, on 17 September 1873, it was ready for consecration by Chief Rabbi Nathan Adler, in time for Rosh Hashanah. By 1907, the congregation started to become financially secure and a search began for more suitable premises. Building and philanthropist Emmanuel Nove became the driving force, together with two distinguished industrial chemists who lived nearby. Dr Ivan Levenstein – pioneer of a dyeing process at what became ICI’s works in Blackley – and Dr J P Dreyfus – the founder of the Clayton Aniline Company where Chaim Weitzman carried out research during his stay in Manchester (it was Dreyfus who later introduced Weitzman to Lord Balfour). Two sites were shortlisted: Norman Road in Rusholme, opposite Platt Fields, and Wilbraham Road in Fallowfield. Despite being the more favoured location as it was convenient for members of the community who lived in the highly select area of Victoria Park, Norman Road had to be abandoned as the site was too small and within two years the congregation had its new building, designed by 23-year-old local architect, Joseph Sunlight (Joseph Schimschlavitch) as his first major project. Sunlight used advanced construction techniques, particularly for the dome, which attracted attention from as far afield as the United States. The new synagogue, built to accommodation 300 men and 100 women in the gallery, opened with “99 males and a handful of females”, and was consecrated by Chief Rabbi Hertz on 20 October 1913 during the festival of Succot. Fallowfield was to be the community’s home for nearly 90 years. The Synagogue flourished for many years in its new location, due in no small part to the arrival of successive waves of refugees from Europe in the 1930s. Such was the growth in membership that an extension had to be built to the ladies’ gallery, and later additional parallel services had to be held in the new Synagogue Hall during the High Holydays. The community was innovative and led the way with innovations that we now accept as the norm. In 1921, ladies became eligible for election to what we now called the Board of Directors, and 1929 saw the first Bat Chayil. Throughout this period, members of the community became prominent in civic life. In 1877, William Aronsberg was appointed as the first Jewish magistrate I Manchester. Since then the congregation has provided Members of Parliament, several Lord Mayors of Manchester, a High Sheriff of Greater Manchester, two Deputy Lieutenants, local Mayors and judges. Throughout its history, the Synagogue has had to come to terms with demographic trends within the community. In the same way as the move to Fallowfield reflected the move of the membership out of the city centre, so its most recent history reflects the move of many members of the congregation to Hale, Bowdon and the surrounding area. Even though the Synagogue was able to withstand the impact of the opening of new synagogues in Sale, Gatley and Hale for many years, and had strong links with the Jewish student population of Manchester, the decline in membership accelerated from the late 1980s to the extent that the congregation could no longer afford the upkeep of its Grade II listed building. Discussion started on the feasibility of building a new home for the congregation in the Bowdon area and a group of benefactors independently undertook to build a new synagogue in the area. In November 2001 the congregation decided to sell its premises in Fallowfield to a Jewish student trust and to move its home to the new synagogue in Bowdon. 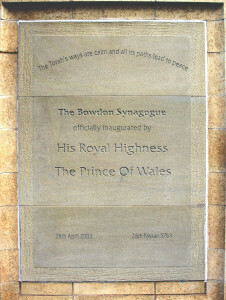 The first services in the new building were held on 10 August 2002, when the congregation were joined by members of the Bowdon Minyan, with the Synagogue officially opening for Rosh Hashanah. The opening was marked by a visit by HRH Prince of Wales in 2003 and by a visit by the Chief Rabbi, Dr Jonathan Sacks in April 2004. Today, under the leadership of Rabbi Dovid Lewis and his wife Nachi, the congregation is still growing and celebrated its 140th birthday with renewed vigour and excitement for the future. The community has developed a vibrancy and strength that was probably but a dream for our founders so long ago.